Callaway Golf has unveiled its Odyssey Works line of putters. Odyssey Works’ new line of putters will be available Jan. 30. Callaway says each new Odyssey Works putters will feature a new Fusion RX insert with Versa alignment, as well as popular head shapes that include the #1 Wide and the #7. 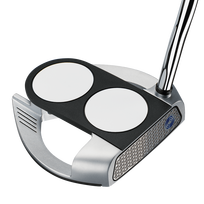 Odyssey Works also has revealed a new head shape – the 2-Ball Fang – that Callaway says it’s the “most accurate’’ 2-Ball putter in its history. In that regard, Odyssey putters probably are the most successful products – and the most consistently performing – over the years in the Callaway equipment catalog. The 2015 Odyssey Works putter line begins with a suggested retail price of $179.99 each; the 2-Ball Fang putter carries an SRP of $199.99.